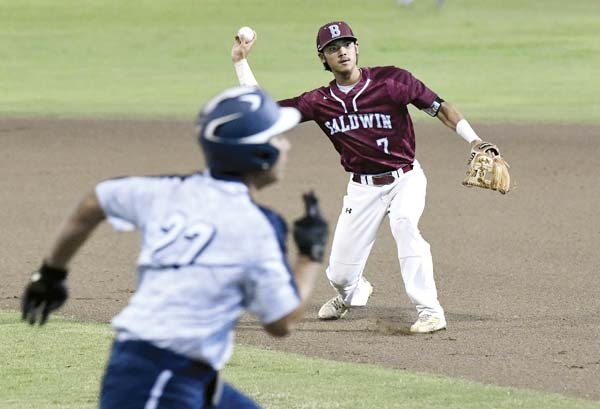 WAILUKU — As the first Maui Interscholastic League team in any sport to be nationally ranked, this Baldwin High School baseball team is unique. The Bears checked in at No. 23 on Wednesday in the USA Today Super 25, the seventh straight week the nine-time defending MIL champions have been on the exclusive list. To Wallace Fujii — “Uncle Wally” to most of his former students — they are just the Bears. His favorite team — no matter the sport, no matter the record, no matter the day of the week — is the Baldwin Bears. That is a scouting report that Fujii would be proud to deliver for any of the maroon-and-blue-clad teams he supports. Baldwin High's Bubba Hoopii-Tuionetoa is 5-0 in MIL games this season. His wife of 58 years, Gladys, died in September, so his journeys to Baldwin games are a little more lonely now. 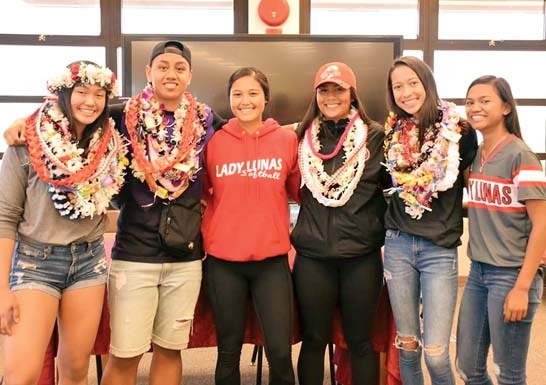 Basketball, soccer, softball, volleyball, football and baseball are his favorites — his Baldwin fandom dates back to 1962 when he started at the Wailuku school as a teacher. He remembered one quote from a student from the 1991 graduation ceremony. 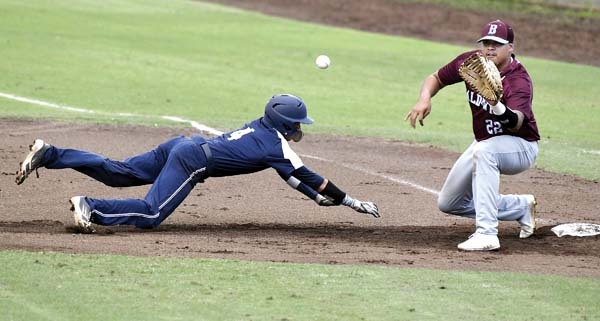 Baldwin High second baseman Jacob Chong throws out Kamehameha Maui's Konnor Palmeira. 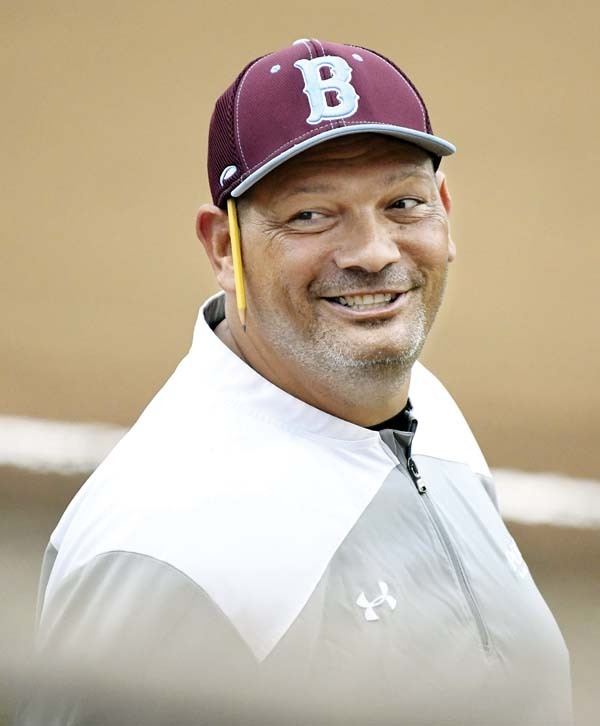 While he was hesitant to call this team the best he has seen wear the maroon and Carolina blue, the players know what is at stake beginning Wednesday when they will open the Wally Yonamine Foundation Division I state tournament as the No. 1 seed. 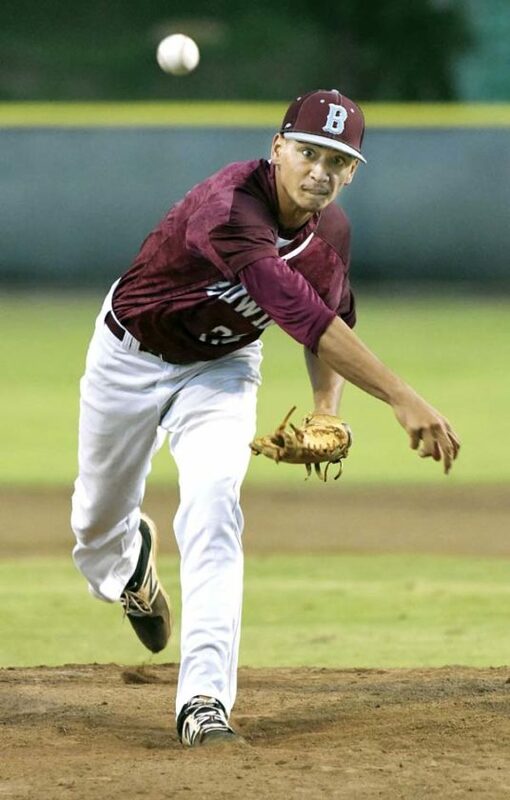 Six current starters — pitcher/shortstop Kaipo Haole, first baseman Nainoa Keahi, second baseman Jacob Chong, pitcher/outfielder Bubba Hoopii-Tuionetoa, third baseman Chayce Akaka and catcher Cade Kalehuawehe — all started the 2016 state championship game for the Bears, a 6-1 win over Pearl City. Bobby Drayer, the current starter in left field, had a hit and scored a run as a pinch hitter in that game. Last season, the Bears were seeded third at state, but lost both of their games, 6-1 to Kamehameha Kapalama and 7-2 to Kailua. Maui High ended up winning the state championship. Now, the national recognition puts a little more emphasis on seemingly everything. 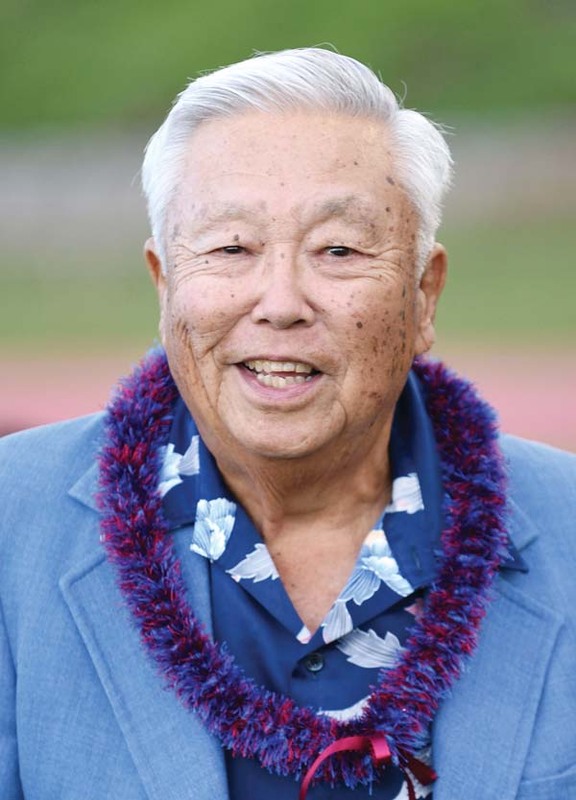 Former Baldwin High Principal “Uncle Wally” Fujii is one of the Bears baseball team’s strongest and most avid supporters. Dudoit said it means the world to be part of the Baldwin ohana, where fans like Fujii and former Athletic Director Jon Garcia come to games. 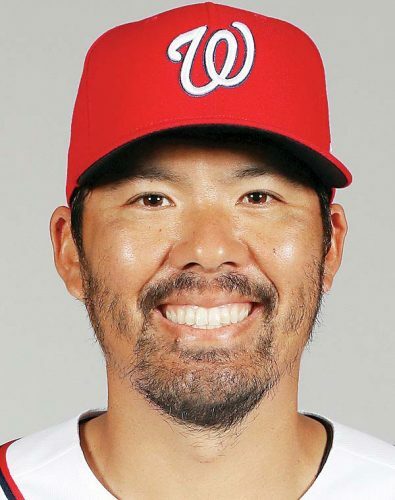 The school’s gym is named after Garcia, who can often be seen at Bears’ games along with the parents of Kurt Suzuki, an alumnus and catcher for the Atlanta Braves who is in his 12th major league season. Longtime Baldwin assistant coaches Tyson and Kimo Higa are also alumni of the school. “You know, what I love coaching at Baldwin is the family atmosphere that we have,” Dudoit said. “Warren Shima-bukuro, the Suzukis, Kimo and Tyson Higa’s parents are at games. I mean Mr. Fujii is there every game, and he comes down to shake our hands after the games, win or lose. Haole won the 2016 state title game on the mound as a freshman. Keahi will play football at Chabot College in Heyward, Calif., in the fall, but he wants to leave Baldwin with another state title. 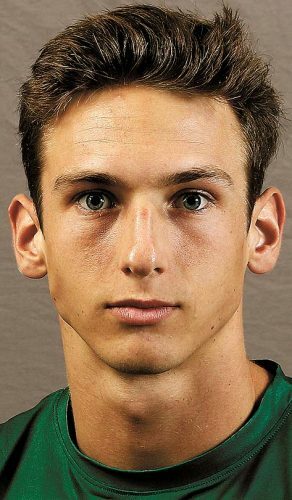 * Robert Collias can be reached at rcollias@maui news.com. Kamehameha Maui vs. Campbell, 10 a.m.
Kailua vs. Leilehua, 1 p.m.
Iolani vs. Kalani, 4 p.m.
Pearl City vs. Punahou, 7 p.m.
Kamehameha Maui-Campbell loser vs. Kailua-Leilehua loser at Hans L’Orange, 9 a.m.
No. 3 Waiakea vs. Kamehameha Maui-Campbell winner, 10 a.m.
No. 4 Mililani vs. Iolani-Kalani winner, 1 p.m.
No. 1 Baldwin vs. Pearl City-Punahou winner, 4 p.m.
No. 2 Mid-Pacific vs. Kailua-Leilehua winner, 7 p.m.
Pearl City-Punahou loser vs. Iolani-Kalani loser at Hans L’Orange, 9 a.m.
Fifth-place semifinals at Hans L’Orange, 4:30 and 7 p.m. Semifinals, 4 and 7 p.m.
Consolation final at Hans L’Orange, 11 a.m.
Fifth-place game at Hans L’Orange, 1:30 p.m.